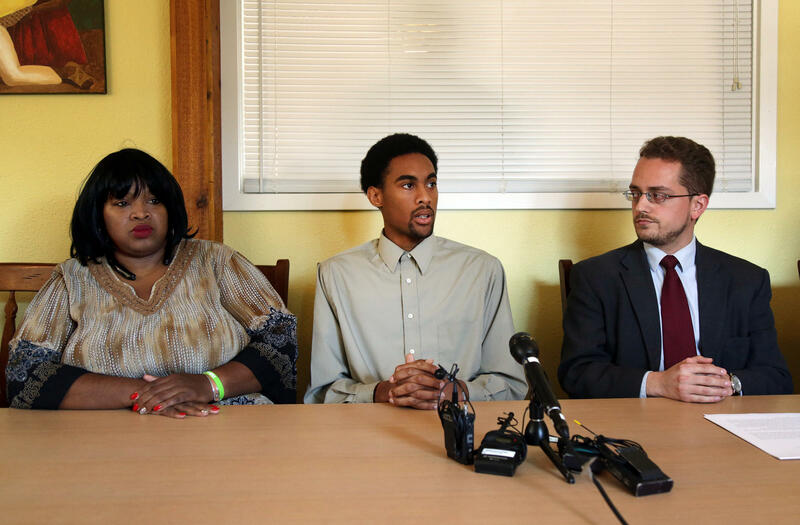 Plaintiff Jeremy King (center) speaks Monday at a press conference called by his attorney Brian McGiverin (right). King's mother Nevetta King (left) sat with her son. A local law firm is suing Austin police officers involved in an incident on Sixth Street downtown early in the morning of Nov. 6, 2015. The lawsuit [in full here] claims that officers used excessive force and singled out and arrested two African-Americans for jaywalking, a misdemeanor offense. A video of the incident gained national attention and hundreds of thousands of YouTube plays. The following version of that video was posted to YouTube by a group called PINAC, which stands for Photography is Not a Crime, a couple of days after the arrests. The video contains profanity and the use of physical force. One of the two plaintiffs, Lourdes Glen, is a Hispanic woman who was arrested after questioning what police were doing. You can see her being handcuffed around halfway through the video. Austin attorney Brian McGiverin is representing Glen and the other plaintiff, Jeremy King, one of the two men arrested for “crossing against the light,” which is the reason stated for the arrest at one point by one officer in the video. Both plaintiffs, who live in Bexar County and were visiting Austin when the incident occurred, spoke at a press conference Monday. King can be seen in the video being handcuffed by officers and lying on the ground with an officer’s knee on top of his neck area. King said he felt that he was discriminated against by the officers because of his race. He says that's because friends of his, who are not African-American but were also jaywalking, were not arrested for the misdemeanor that night. When McGiverin was asked why it took so long to file this suit, since the incident took place in November, King jumped in and responded, saying he'd spoken to several other lawyers, who would not take the case because "there wasn't enough injury." The suit filed Monday with the U.S. District Court says King suffered a cervical strain, wrist sprain, contusions and abrasions due to the force used by APD. The lawsuit seeks compensatory and punitive damages, along with legal costs. The suit also requests a jury trial. McGiverin said they hoped to "raise awareness about the reality of how police officers are conducting themselves." The Austin Police Department said after the arrests that the incident was being reviewed. 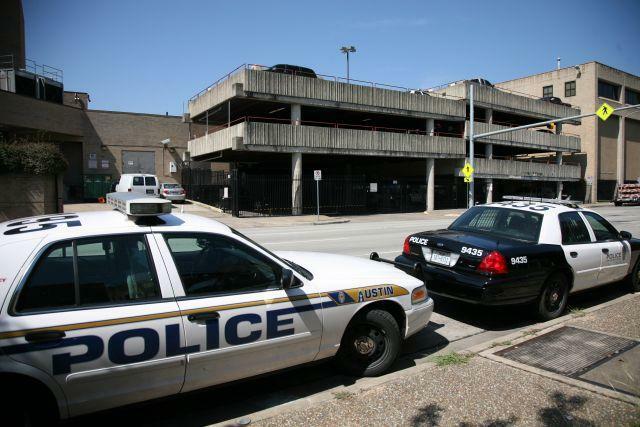 KUT’s request for the findings of that review are still pending. Austin Police Chief Art Acevedo has said he wants body cameras on his officers by the end of this year. While there have been a lot of questions about what happens with these videos once they’re recorded, APD is considering the best possible practices for dealing with the footage. Ever see flashing red and blue lights of a police cruiser on your block and wonder what they are doing over there? Here's how to find out. 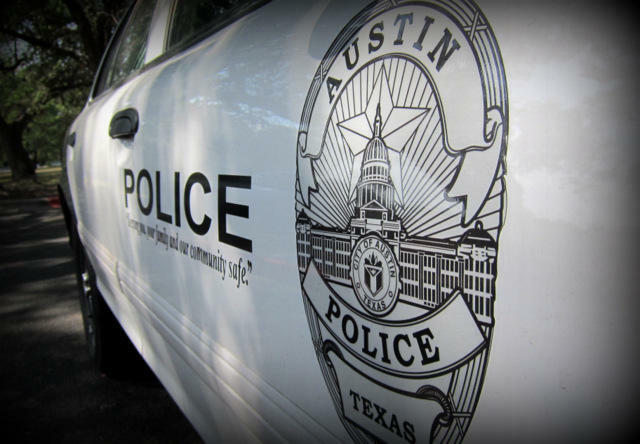 The Austin Police Departments' Public Information office is open during normal business hours. You can start by calling them directly at 512-974-5017. When Can Austin Police Officers Use Pepper Spray? The YouTube video that surfaced last weekend of an Austin Police officer pepper-spraying a suspect on Sixth Street has many questioning use of force by APD. In 2014, the department documented 147 incidents of the use of pepper spray, but when can they use it, how is it justified and how exactly does the review process work? Let's take a look at APD's guidelines.